Over 50 leading cultural figures read sections of the book alongside members of the public to create the UK’s first ever live reading, on the site of the inspiration for the Ministry of Truth – Senate House. The reading was offered as an act of subversion in itself, an included immersive staged elements, submerging audiences in the world of Big Brother, IngSoc and The Party. 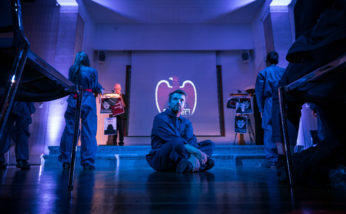 Using projection and actors from UCL, the audience were able to absorb the intrigue and horror of 1984. The reading was directed by Hannah Price and produced by Libby Brodie Productions. 1984 Live was part of the UCL Festival of Culture 2017 a week-long festival, comprising talks, workshops and exhibitions, set to challenge your thinking and offer new ways of understanding our world. Libraries and Theatres across the country screened the reading and organised satellite events and activities – see below for more information. Journalist and Editor, The Oldie. Writer. Winner of The Orwell Prize for Exposing Britain’s Social Evils 2016. Editor, BBC Radio Current Affairs. Lord Macdonald QC, Chair of The Orwell Foundation and Liberal Democrat Member of the House of Lords. Journalist, Author and former Foreign Correspondent. Son of Georges Kopp, Orwell’s commander in the POUM. Editor, Nature journal. Author of The Life Project (2016), longlisted for The Orwell Prize for Books 2017. Journalist and Literary Critic. Curator of M-Fest: A Muslim Festival of Books and Ideas. Deputy Editor of Wasafiri Magazine. Award-Winning Journalist, shortlisted for The Orwell Prize 2015. Writer, broadcaster and award-winning feminist campaigner. Author of Do it Like a Woman (2015). Journalist, Columnist at the Mail on Sunday. Winner of the Orwell Prize for Journalism 2010. Writer and Journalist. Shortlisted for the Orwell Prize for Books 2017. Journalist and Writer, most recently co-author of Cut (2016). Longlisted for The Orwell Prize for Books 2017. Solicitor and academic best known for actions on behalf of Princess Diana, Deborah Lipstadt and Heather Mills. Award winning theatre actor. Credits include: “Silk”, “Dr Who” & “Antony & Cleopatra”. Historian, University Professor of History and Art History at Columbia University. Director, Centre for the Study of Media, Culture and Power, King’s College London. Chief Foreign Affairs Columnist, Financial Times. Winner of the Orwell Prize for Journalism 2016. Singer-Songwriter and activist. Albums include Talking With the Taxman About Poetry, and Shine a Light with Joe Henry. Critic, Novelist and Biographer. Author of Orwell (2003) award-winning biography of George Orwell. Television Presenter and author of None of the Above (2015). Crime fiction writer, Biographer and Historian. Shortlisted for The Orwell Prize for Books 2017. Head of Corporate and Community Affairs, BBC Northern Ireland. Actor. Recent credits include “The Inbetweeners Movie” and “The Philanthropist”. Journalist, creator of The Road to Wigan Pier Project, Daily Mirror. Shortlisted for the Orwell Prize for Exposing Britain’s Social Evils 2017. Journalist and Conservative Member of the House of Lords. Former Editor-in-Chief of the Wall Street Journal Europe. British-Nigerian Writer, Broadcaster and Historian. Author of Black and British, longlisted for the Orwell Prize for Books. Coolidge Professor of History at Harvard Univeristy. Professor in History and Foreign Policy at King’s College London. Shortlisted for The Orwell Prize for Books 2017. Turkish Journalist and Author. Fired as a columnist from Habertürk after writing articles critical of the government. Head of Culture, the Daily Telegraph. Broadcaster, author and member of the House of Lords, best known for the BBC Radio 4 Programme In Our Time. Award-Winning Television and Film Director, most recently I, Daniel Blake. Journalist. Shortlisted for the Orwell Prize for Journalism 2017. Writer, Political Commentator and Journalist. Media diarist for The Independent. Dean of Arts and Humanities at UCL. Playwright whose work has been produced by the National Theatre, Royal Shakespeare Company and Royal Court Theatre. He lost his virginity in 1984. Former MP for Hull West and Hessle, former Home Secretary and winner of The Orwell Prize for Books 2014. Actor. Most recent work : Boa, Brutus, King Henry and Prospero in the Donmar all-female Shakespeare Trilogy. Recent films include “The Sense of an Ending”. Author of Brutus and Other Heroines. Actor. Recent credits include: “Boa”, “Death of a Salesman” and on film “Fantastic Beasts and Where to Find Them”. Poet, performer and author. Contributor to The Good Immigrant (2016). Actor and filmmaker. Founding member of British East Asian Artists. Actor and writer. One of 21 featured essayists in the award-winning The Good Immigrant (2016). Scottish journalist and writer. Visiting Professor of Archaeology at UCL. American-British playwright, novelist, critic and broadcaster. Book judge for The Orwell Prize for Books 2017. Hannah Price is Co-Artistic Director and Founder of Theatre Uncut, the winner of two Fringe First awards, a Heralds Angel award and the Spirit of the Fringe Award. She was Resident Assistant Director at the Donmar Warehouse and was recently Associate Director to John Malkovich on Good Canary. Libby Brodie Productions has most recently produced the European premiere of Waiting For Waiting For Godot (St James Theatre), Little Shop of Horrors (UK Tour) and the world premiere of Run The Beast Down (Marlowe Theatre, Finborough Theatre) and currently, The Philanthropist (Trafalgar Studios). Philip Matejtschuk is a twice-Offie nominated London-based sound designer and composer, whose most recent work includes Brimstone & Treacle (Hope Theatre), Jekyll & Hyde (Pleasance London), Tom Molineaux (Jack Studio Theatre), and Adding Machine (Finborough Theatre). Philip is also Head of Sound at Italia Conti. Camera: Patrick Robinson, Phil Mason, Alejandro Lopez. Live stream director: Matt Aucott. Poole Central Library will be showing the live-streaming at Poole Central Library, Dolphin Centre, BH15 1QE from 9am. People are welcome to drop in through the day, no bookings or tickets required. Halton Libraries will be screening the live-stream of the reading on 6th June. Kidderminster Library will screen the live-stream of the reading during opening hours on 6th June. Huddersfield Library (HD1 2SU) will be screening the live-stream of the reading on 6th June. Redbridge Libraries Gants Hill will be screening the live-stream of the reading on 6th June. Leeds Central Library will be screening the live-stream of the reading on 6th June from 9am until 5pm and on Wednesday 7th June will host a 1984 Live Film Screening, at 6pm (doors 5.15pm) in Room 700, Leeds Central Library. Little Nephews Monday 19 June at 6.15pm Dr Adam Stock from York St John University will trace the ways in which works of literature, film, TV and graphic novels from the 1950s to the present have engaged with Orwell’s dystopian novel.